This facinating letter was sent to George Musgrove in July 1891 from his brother in law George Harris (Emily's brother). It would imply that both families had not been in contact with each other for some time. 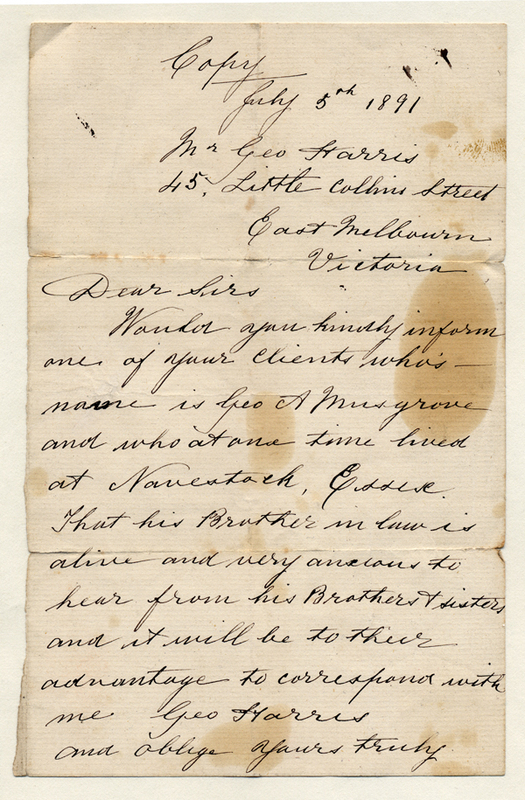 The letter was written quoting an address 45 Little Collins Street, East Melbourne, Victoria (probably a business address), and addressed probably to a solicitor or bank asking them to forward the letter to their client Geo A Musgrove, who at one time lived at Navestock Essex. We know the Musgroves lived here for a short time eleven years before in 1880. George Harris states that it would be in the Musgroves interest to contact him, but whether they did we'll never know. We believe George or Emily kept the letter and after their death the letter was rediscovered by Lambert William Harris (Emily's brother) when he was executor to the Musgrove estate. Lambert Harris appearently made attempts to trace his brother George in Australia through a firm of solicitors years later. George Musgrove died in 1900 so this letter would be ten years old by the time Lambert acquired it. He had no success in tracing his brother George and we have no knowledge of whether he married and raised a family in Australia or returned to England. Please email us if you think you are a descedant.